Multiple deaths and injuries are reported in Sanaa, Yemen, after a suicide bomber attack on two mosques in the center of the capital during Friday prayers, police and witnesses say. Islamic State militants have claimed responsibility for the deadly suicide bomb attack, according to their statement cited by Reuters. At least 126 people were killed and some 250 more were wounded, medical sources told Reuters. There are conflicting reports on the number of casualties as they continue to rise. CNN cited two Houthi officials who said the death toll was 120 people, while 300 more were injured. Previous reports from Al-Jazeera suggested 90 were killed, with least 280 injured. 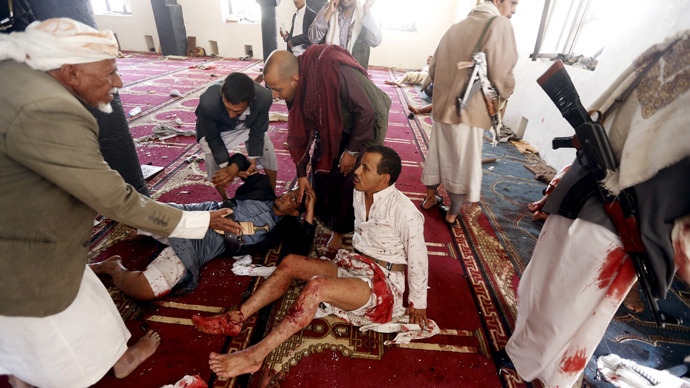 The attacks took place in Badr mosque and Hashush in Yemeni capital. Some witnesses said they heard at least three blasts in one of the mosques. One witness, cited by Reuters, said he heard two successive blasts at the Badr mosque. "I was going to pray at the mosque then heard the first explosion, and a second later I heard another one," he said. The mosques in the center of Sanaa are known to be used mainly by supporters of the Shiite Muslim Houthi group which, earlier this year seized power in Yemen forcing President Abd-Rabbu Mansour Hadi to resign. The Yemeni parliament rejected Hadi’s resignation. The president managed to escape from house-arrest and flee to the south of the country. He is now attempting to govern the country from the port city of Aden. Hadi enjoys the support of the West as well as the Gulf States. The Houthis support former President Ali Abdullah Saleh. The blast comes a day after intense gun battles in Aden between troops loyal to Yemen's former and current president left 13 dead, according to AP.